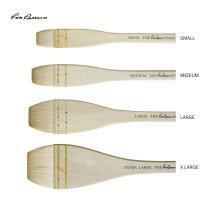 A unique brush inspired by Ron Ranson's 'fast and loose' style. Also avaiable in a starter set. 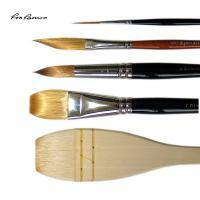 These brushes are sold throughout the country to artists who wish to emulate the unique technique of Ron Ranson who paints in the ‘fast and loose’ manner. His many books and DVDs are available through bookshops. The hair used in the manufacture of these hakes is goat, so please clean in cold water, otherwise there might be a tendancy to shrink.